Cyclin B1 expression is restricted to a specific short period of the cell cycle with cyclin B1 expression detected earlier and peaking in concentration before cyclin B2 expression. Fusion protein corresponding to Hamster Cyclin B1. 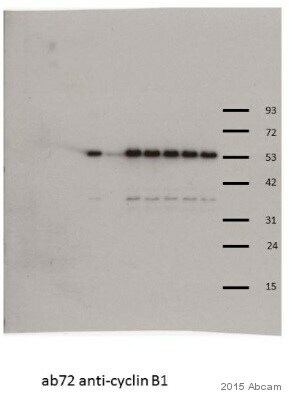 His-tagged Hamster Cyclin B1 expressed in bacteria, harvested from inclusion bodies, extracted with 6M guanidine HCl and purified on Nickel beads. WB: HeLa, Daudi, K562, Jurkat and HEK-293 whole cell lysate. IHC-P: Human tonsil tissue. Flow Cytometry: HeLa cells. 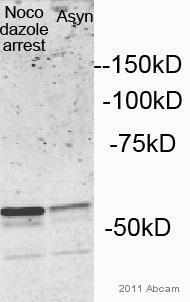 This monoclonal antibody to cyclin B1 has been knockout validated in Western blot. The expected band for cyclin B1 was observed in wild type cells and the band was not seen in knockout cells. Our Abpromise guarantee covers the use of ab72 in the following tested applications. WB Use a concentration of 1 µg/ml. Detects a band of approximately 55 kDa (predicted molecular weight: 48 kDa). Abcam recommends using 5% Milk as the blocking agent. Lanes 1 - 4: Merged signal (red and green). 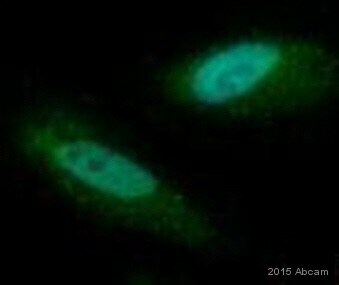 Green - ab72 observed at 55 kDa. Red - loading control, ab181602, observed at 37 kDa. ab72 detected the expected band for Cyclin B1 in wild type HAP1 cells and the band was not seen in Cyclin B1 knockout HAP1 cells. Wild-type and Cyclin B1 knockout samples were subjected to SDS-PAGE. Ab72 and ab181602 (Rabbit anti GAPDH loading control) were incubated overnight at 4°C at 1 ug/ml and 1/10000 dilution respectively. Blots were developed with Goat anti-Mouse IgG H&L (IRDye® 800CW) preabsorbed ab216772 and Goat anti-Rabbit IgG H&L (IRDye® 680RD) preabsorbed ab216777 secondary antibodies at 1/10000 dilution for 1 hour at room temperature before imaging. ab72 staining Cyclin B1 in human tonsil tissue - formalin-fixed paraffin-embedded section, performed on a Leica BondTM system using the standard protocol F. The section was pre-treated using heat mediated antigen retrieval with sodium citrate buffer (pH 6, epitope retrieval solution 1) for 20 minutes. The section was then incubated with ab72, 5 µg/ml, for 15 minutes at room temperature and detected using an HRP conjugated compact polymer system. DAB was used as the chromogen. The section was then counterstained with haematoxylin and mounted with DPX. Additional bands at: 36 kDa, 77 kDa. We are unsure as to the identity of these extra bands. Lanes 1-9 shows the Cyclin B1 wave as HeLa cells enter and exit mitosis. HeLa cells were synchronised in the early S phase by double thymidine block then released to synchronously enter mitosis. Time points were taken at the points indicated. HeLa (Human epithelial cell line from cervix adenocarcinoma) whole cell lysate loaded at 25 µg per lane. ab72 used at 1/500 in reducing conditions in conjunction with goat anti mouse (HRP) 1/20,000. This image is courtesy of an Abreview submitted on 12 September 2005. We do not have any further information relating to this image. HeLa (Human epithelial cell line from cervix adenocarcinoma) cells stained for Cyclin B1 using ab72 at a dilution of 1/500 in ICC/IF. Secondary used is a Fluorescin-conjugated Goat Anti-Mouse IgG. 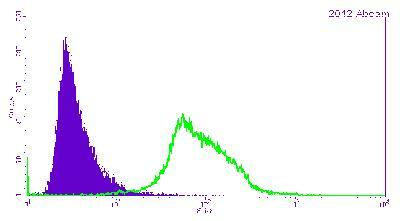 Primary antibody incubated for 12 hours at +4°C in TBS. Blocked using 1% BSA for 10 minutes at 25°C. Cells were permeabilized with Tween-20. Publishing research using ab72? Please let us know so that we can cite the reference in this datasheet. 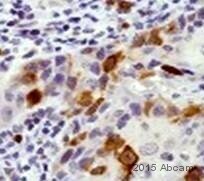 I recently purchased the ab72 cyclin B1 antibody to be used in experiments as a mitotic marker. The experiments i was perfoming were time courses and drug arrests using hela cells. 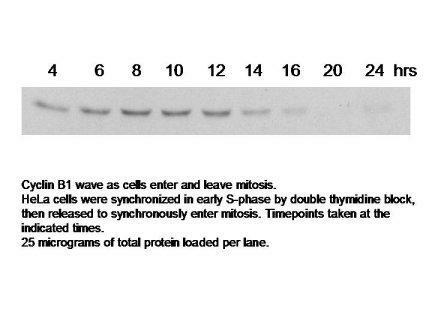 In blots this antibody seemed to detect two bands, one at the expected 62kDa and one above this at about 80. not only this but comparisons using S phase cells versus M phase cells showed no significant difference for cyclin B1, as a control phosphorylated histone H3 was used and was only detectable in M phase lysates as expected. From this data it would sugesst that this antibody does not recognise cyclin B1. Can you suggest any reasons for these observations. I'm sorry to hear that you are having trouble with ab72. Over the last couple of months, we have received two reviews from customers who are very pleased with the results of this antibody, please see the reviews section of the online datasheet for more details. Perhaps you have received a faulty vial of this antibody? We would be happy to forward a second vial or alternatively, you might like to try either of our two polyclonals to cyclin B1. (ab7957 and ab2096) Please let me know how you wish to proceed.